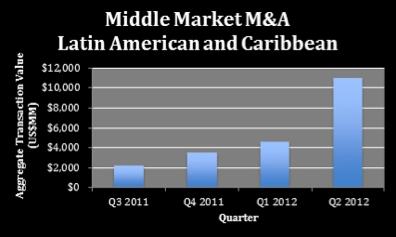 Over the past four quarters, there has been significant growth in M&A activity in the middle market of Latin America and the Caribbean. Both the number of M&A deals, aggregate value, and average value of M&A transactions in these regions have increased substantially. The number of deals have increased in each quarter, from 45 in Q3 of 2011, to 83 in Q4 of 2011, to 107 in Q1 of 2012, and finally to 135 in Q2 of 2012. Additionally, the aggregate value of these transactions increased substantially, from US$2,203MM in Q3 of 2011 to US$11,043MM in Q2 of 2012. In terms of the average value per transaction, the first three quarters mentioned had fairly consistent figures (US$48.9MM, US$41.9MM, and US$43.6MM). However, Q2 of 2012 saw an 87% increase in the average value per transaction, jumping to US$81.8MM. A portion of this spike can be attributed to the M&A activity in energy and consumer staples, which experienced exponential increases. 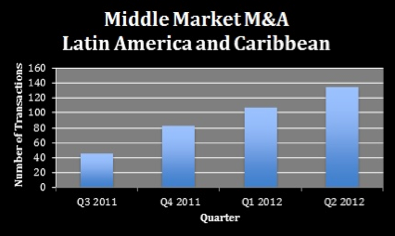 As a result of these drastic increases in M&A activity, Brazilian middle market M&A now represents 31% of all middle market M&A deals in Latin America and the Caribbean. There are a number of reasons for this, including currency factors, changes in antitrust laws, growth in infrastructure projects in Brazil related to the impending Olympic Games and World Cup events, etc. Versailles Group represented SuperMedia LLC (Nasdaq:SPMD) in its sale of Inceptor, a North American Search Engine Marketing company, to Didit.com. This is the second successful divestiture Versailles Group has completed for SuperMedia. Versailles Group has over 25 years’ experience in completing successful transactions. As an expert in international mergers, acquisitions, and divestitures, we would be happy to talk with you about how we could help your company with any M&A transactions you may be contemplating. Here is a link, Yahoo Finance , to the actual Press Release or the text is listed below for your convenience. BOSTON, Aug. 22, 2012 /PRNewswire-iReach/ -- Versailles Group, Ltd. ( www.versaillesgroup.com ) announced today that the assets of Idearc Inceptor, LLC a provider of SEO, Paid Search Marketing and Social Media Marketing, and a wholly owned subsidiary of SuperMedia LLC (SPMD), have been acquired by Didit.com. Versailles Group acted as exclusive financial advisor to SuperMedia. Terms were not disclosed. The transaction closed on August 21st. Versailles Group, a 25-year-old Boston-based investment bank that specializes in international mergers, acquisitions, and divestitures, advised SuperMedia on the transaction. 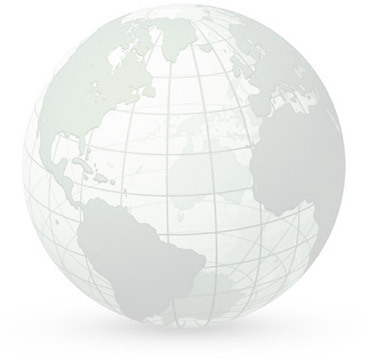 Versailles Group works with companies in the U.S., Europe, Canada, Asia, and South America. "With Versailles Group's unique approach to Mergers & Acquisitions, we received responses on this transaction from over 200 prospective buyers in 25 different countries, said Donald Grava, Versailles Group's Founder and President. "We're excited that Didit emerged as the eventual buyer as it provides Inceptor with a number of synergies." Didit.com is a privately held industry pioneer in Search Engine Marketing and Digital Marketing founded in 1996. Didit's proprietary Maestro search and auction-based display campaign optimization technology combine with recent advances in the application of "Big Data" to SEM and display campaigns. Didit pioneered the "Managed Technology" model of cross-medial digital campaign management for marketers and agencies, earning Didit.com both Inc. 500 and Deloitte Technology Fast 500 recognition as a rapidly growing company. Versailles Group, Ltd. is a Boston-based investment bank that specializes in international mergers, acquisitions, and divestitures. It provides its clients with a high level of personal attention, international experience, and professional execution. Since 1987, Versailles Group's skill, flexibility, and experience have enabled it to successfully close transactions, both domestically and internationally, in all economic environments. More information on Versailles Group can be found on its website, www.versaillesgroup.com.